Pekin pattern - Green background - Gaudy Willow. 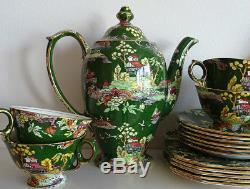 This listing is for a beautiful vintage coffee/tea service. 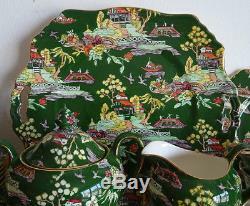 Made by Royal Winton (Grimwades) in the early 1950's the pattern is called Pekin which was produced with several background colors. This set is in the green colorway. This set consists of one large coffee/tea pot, a creamer and covered sugar bowl, 6 cups and saucers, a large cake plate (serving platter) and 6 smaller individual cake plates. Condition of this set is excellent. The coffee pot has a chip on the edge of the base which was stuck back (see close-up picture), apart from that all pieces are in perfect condition with no other damage or repair/restoration. Please excuse any glares (white patches) that you may see in the pictures, these are caused by reflections of light on the glaze and are not on the actual object itself. 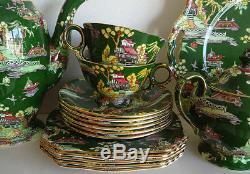 The item "ROYAL WINTON CHINTZ COFFEE/TEA SET GREEN PEKIN GAUDY WILLOW VINTAGE 6 CUPS PLATE" is in sale since Sunday, October 01, 2017. This item is in the category "Pottery & Glass\Pottery & China\China & Dinnerware\Royal Winton/Grimwades". The seller is "albion-antiek" and is located in Amsterdam. This item can be shipped worldwide.